Having his productions and remixes caned by everyone from Pete Tong to James Zabiela can only mean one thing: his star is very much in the ascent. Add to this, the release of a Tech-House Producer sample and loops bank for the prestigious Artist Series on Loopmasters that went straight to the Number One Bestseller position and stayed there for 6 weeks! His sound touches everything from tech-infused progressive, to downright nasty tech-house, creating a pumped-up robo-funk engineered to destroy peaktime floors with pin-point precision. In 2008, Dom Kane remixed for Roger Sanchez and his Stealth Records, the Stereo Hookers on Nuuf Music, and Zimbardo on his Benchmarc Records, Dom proved he’s no one-trick-pony, by then releasing his very first artist album “My Virus”. Add to this, a residency at Ministry Of Sound (London), Space (Ibiza), and A’Priori (Moscow), it’s no wonder IDJ Magazine rated him as: “The Year’s Fastest-Rising Underground Talent”. 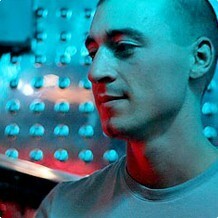 In 2006, Dom was propelled into the big league by his remake of the Orbital classic ‘Halcyon’, Dom inserted his unique blend of electro house and tech-prog to the track, which gained plays from James Zabiela, Hernan Cattaneo, Sander Kleinenberg, Sasha, Paul Van Dyk, Armin Van Buuren, and the almighty Pete Tong on BBC Radio One… not to mention both the Hartnoll brothers behind the original track itself, gaining rave reviews from DJ Mag, IDJ, and Mixmag to name a few. Having first started DJing in 1992 when free-parties were rife, discovering the love of performing to a 2000-strong crowd, by 1995 he was performing with residencies around the Southwest, and guest slots in Ibiza during the summer of 1998. By 2004, Dom began his monthly residency with Proton Radio, and then 2006 saw Dom Kane launch Xeton Records, entering a four-month Tour of Eastern Europe with BenQ-Siemens to launch the new brand of 3G mobile phones, along with high profile gigs and releases, gaining huge exposure and rave reviews. 2007 was Dom Kane’s turning year, with rave reviews from BPM, Mixmag, DJ Mag, 365, EQ, and then no less than six entries in IDJ Magazine for the June 2007 edition including Breaks ‘Top Tune’ and Heavy Rotation (Unique 3 – The Theme remix) and a full artist feature!